1993 happened to be right in the middle of my high school experience, when I was old enough to know I really loved movies but had little idea as to why I did. Not that this is a bad thing; there are certain advantages to being perfectly content spending a Saturday with a double bill of Little Man Tate followed by Necessary Roughness. In celebrating the movies of 1993 this week, and having already come out of the woodwork about not having watched True Romance, I decided to find more 1993 movies that I’d missed, finally landing on Guillermo del Toro’s Spanish language horror flick Cronos. 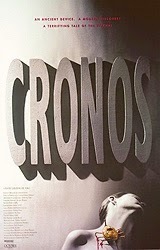 Cronos, which is del Toro’s first feature film, attracted my attention because of his name on the project and the super cool poster art. In the story, an elderly antiques dealer (played by Federico Luppi) and his granddaughter discover a strange device resembling a golden scarab beetle in the bottom of an old statue. In his examination of the device, the dealer unwittingly activates it, and is quickly made subject to the device’s power. Over the next few days, he recognizes that the device is responsible for restoring his youth and vitality, but with it, a troublesome thirst for human blood. To add to his troubles, a wealthy but dying CEO has been coveting the device and its secret for years, and has sent his thuggish nephew (Ron Perlman) to track it down from the antiques dealer. I have some sizable holes in my del Toro filmography (I haven’t seen The Devil’s Backbone or The Orphanage) but what I consistently appreciate and notice about his work is that he imbues it with a sense of wonder and enthusiasm. It would be easy to call del Toro’s attitude child-like, but I think it’s more than that; it’s a worldview where the magical, the horrifying, and the mundane exist in an easy juxtaposition. This worldview is probably why many of the characters in his worlds are children or have the purity of purpose that many children have. Although the movie follows the old antiques dealer and the growing complications that pile up with his transformation, it is really the granddaughter whose perspective is the most valuable and is at the heart of the film. My favorite scene in the entire movie (very minor spoilers) is when the antiques dealer has been on the run, unable to turn to any allies, ducking the villain and his henchman nephew, bewildered by the unpredictable nature of his transformation initiated by the scarab device. He finally turns to his granddaughter, coming to her door at night and looming over her as she opens it. Perhaps in another movie, this is a scare, or she screams, or we’re counting down the beats before the monster comes to attack the one thing he used to love. But it is none of that. The granddaughter reacts to her beloved but much changed grandfather in a beautiful and remarkable way. Her reaction reminded me of something del Toro once said about monsters, that they are symbols of great power, but not necessarily always for evil. Despite the presence of the monstrous and the grotesque, we’re invited to sympathize rather than just be repulsed, which is only possible if we have adopted the magical, horrifying, yet grounded world that del Toro has created. Cronos is often described as a “vampire” movie, and the parallels are there in the movie to support that, most overtly in the bloodthirst and aspects of immortality. However, the movie feels closer to the story of Frankenstein rather than Dracula. The elderly antique dealer lacks much of the invasive, violent, and obsessive vibe of traditional vampire characters. Frankenstein’s monster always struggles with the nature of his existence, not understanding why he was created and growing more frustrated, melancholy, and empty as time passes, realizing that his uniqueness makes utterly him alone in the universe. As the antiques dealer investigates and discovers more about his condition, he finds that his immortality and indestructability is no miraculous preservation, but always comes at great personal cost. His horror at the nature of his own existence makes him a more sympathetic character, and thus feels closer to the inherent dilemma of Frankenstein’s monster, rather than Dracula. Much of the movie is filmed in that flat, monotone gray palette that always announces “from the 1990s” to me, but, as if a testament to del Toro’s background as a makeup artist, the practical makeup is fantastic. 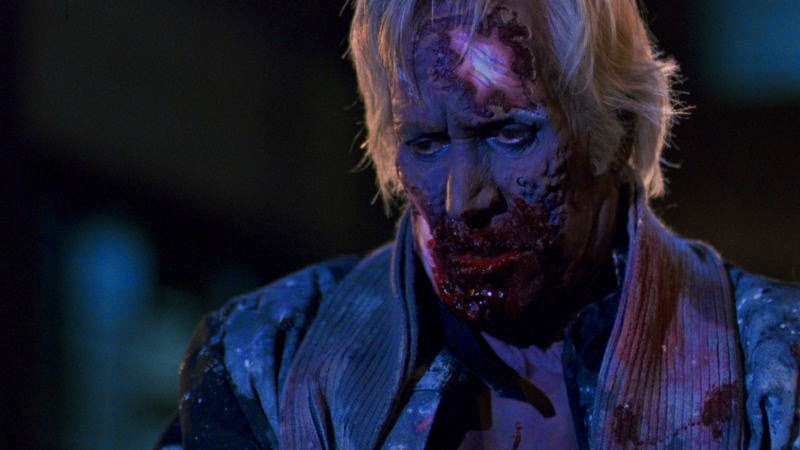 The transformation of Federico Luppi throughout the movie is grotesque and visceral in all of the right ways; the revelation of his “new skin” was particularly effective. I will admit that I am a horror movie wuss, but there were some delightfully evocative moments as the antiques dealer slowly experiences the new urges the Cronos device has put into him; it wasn’t enough to get me squeamish (nor was it meant to be), but I felt the appropriate discomfort evoked by the story. 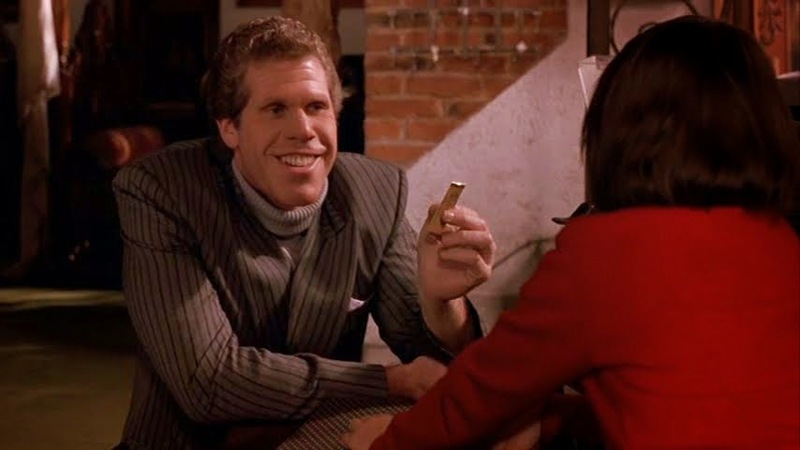 Ron Perlman mentioned in an interview that he was intrigued by characters that are unusual and deformed but who are actually endearing, because personal experience made him empathize with the complexity of those characters. I think Guillermo del Toro shares Perlman’s fascination with complex and seemingly contradictory characters who come in the form of sympathetic monsters, steady-eyed children, and cryptic medieval devices. Although del Toro broadened his artistic palette by taking on bigger and more energetic projects like Hellboy and Pacific Rim, he has not lost the enthusiasm and the wonder of his original voice in Cronos. "Cronos" is Del Toro's best film, in my opinion. Nice review, Mark! It may be my fave as well. Haven't seen it since maybe '96 so its probably time for a Pans Labyrinth/Cronos double feature. Thanks for the flashback Mark. Thanks guys! That is some really high praise for the movie, especially since a lot of people also really love some of his bigger releases (I really love Pan's Labyrinth as well). I'm glad that you guys were taken back to '93; researching movies from that year was the only reason I'd heard of it. I feel like it would also be a good Scary Movie Month re-watch in the future. I have been meaning to watch this for a long time and this has totally sold me. It does look like perfect SMM material but hopefully I will get to see it before then as well.